Moths, fleas and carpet beetles are not a natural fiber such as wool or silk’s best friend. Due to the density of most Oriental, wool and silk rugs, fleas find the perfect home to multiply and lay in wait for the perfect meal to come along. Pesky insects-so small you hardly notice them may be doing damage to your treasured Oriental, wool and silk area rugs and generally, you aren’t aware of them until it’s too late. Adult moths are no threat to natural fibers, the babies are the culprits. Moth larvae survive on the proteins found in natural fibers such as wool and silk and will eat their way through your area rug as they mature. Their mothers and fathers do no damage-except to leave behind eggs from which the hungry larvae hatch. Carpet Beetles and their larvae are more adventurous than moths. Carpet Beetle larvae and adults feast on wool and silk area rugs. Unlike adult moths who are not looking to make a snack out of your area rugs, adult Carpet Beetles will go from one rug to the next in their quest for a meal. Oriental Rug Salon understands the damage insects can do to wool and silk better than most and we have a variety of treatments designed to eliminate insects from your area rugs. Our services are often referred by local veterinarians when one of their clients is experiencing a flea issue with their beautiful Oriental, wool or silk rug. We also receive calls from insurance companies, interior designers, and homeowners seeking an effective – safe remedy to combat a wide variety damaging insects while striving to protect the look, value and integrity of one’s fine wool or silk rug. 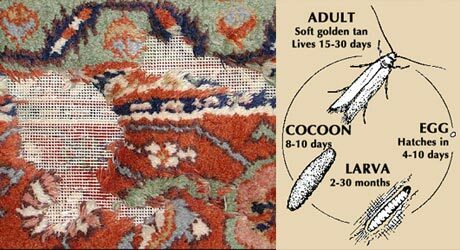 For more information on how to identify moth and insect damage on your beautiful Oriental, Persian, wool and silk area rugs, please click on this sentence to view our video.